At the end of college, my friends were either getting ready to belly flop into the world of Reality with jobs (or not) or tying the knot with their sweethearts for future wedded bliss. But me? I had been trying all year long to secure myself a job before graduation in case Plan A failed, and no bites. It could have been depressing if I didn’t get The Call one Spring evening while I was running across campus with my friend Lauren, on our way to the Communications building on some errand I can’t recall now. What I do remember is this: feeling my cellphone buzzing in my pocket, stopping on the sidewalk and answering the phone , the way sweat made my hands clammy as my mother spoke on the other end of the line, telling me that the professor’s wife had called the house to say I’d been accepted into graduate school. I was beyond excited that I got to delay Reality for three more years in the pursuit of studying creative writing. My first semester in 2010 was a whirlwind of firsts. I met my best buddies for the next three years: my fellow grad cohorts who would see every piece of writing I’d bring to the table and make me a better writer for it. I had to teach to keep up my end of the tuition bargain, which was one of the scariest things I ever had to do in my life. Being a shy introvert who barely raised her hand in class, and now had to teach two college classes a semester. It would be a long time before I’d walk into my classroom without a dry mouth and rolling stomach. As much fun as I was having (like riding a roller coaster in the dark), I realized that I was missing something. I wanted to write teen fiction, but none of the professors were experienced in the genre. The majority of my cohorts were more interested in literary fiction than genre, so my classes and workshops were centered on that style and philosophy of writing. As great as these lessons were, I knew I wasn’t writing the stories for class that I secretly (or not-so-secretly) wanted to write. I needed an outlet. I found out about Figment.com from a New York Times article about a brand-new site that was inspired by teens writing and reading and, of course, Japanese cellphone novels. I had heard about cellphone novels before. I had a pretty terrible phone with a slide-out keypad at a time when everyone else had smartphones, so I couldn’t imagine literally writing on a phone. BUT! I loved the idea of writing serially – just one chapter at a time – and that Figment.com was encouraging that type of writing on their site. So I signed up as soon as possible, right around the time that Figment opened to the public. Stories had already been posted from the beta testing, and one of the first stories I read came from user Linna Lee, who ended up being one of the first of many close-but-never-met-in-person writer friends in the coming years. I can’t believe it’s been seven years since I joined. My gosh. It feels like no time has passed, but in some ways, I have passed through the rise of a fantastic site, major changes, and the slow but inevitable death that began when the site changed hands for the final time. Figment.com will now become Underlined. And while I’m curious and interested in participating in whatever small way I can now with my writing workload, I know that Figment.com will soon be erased. All traces of its existence gone forever in a way that is both heartbreaking and scary. If I was a superhero, I’d tell you that my origin story was Figment.com. My Chemical X. But once it’s gone, I’ll only have my screenshots to know that it was real, and my friends as we reminisce about the days when we were free to experiment and develop some of the most amazing stories that still leave me shaken today. 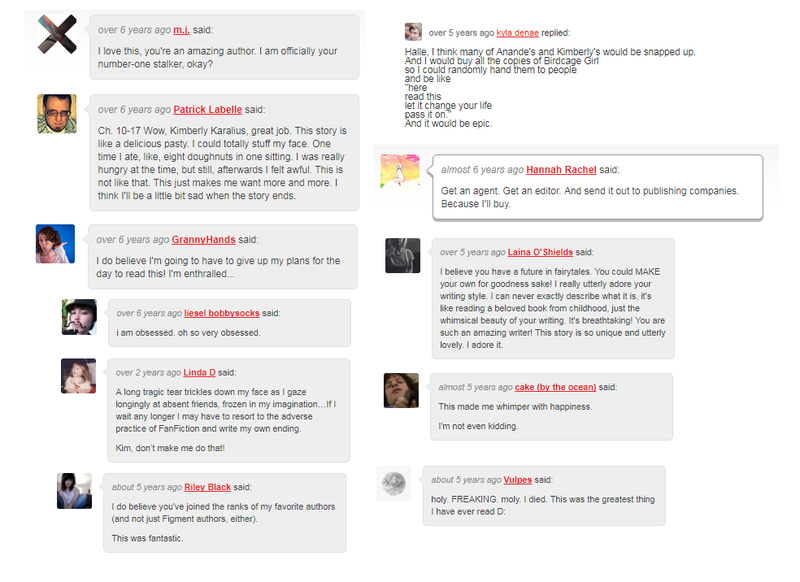 The stories I posted were similarly whimsical: girls discovering cursed carousels at night, boys with shapeshifting mothers for hearts, skeleton friends, mermaids in glitter baths who wrote letters to the sea, boys and bees, silent film stars doomed to never speak, and a girl trapped a birdcage and the handsome butler with the creaky knees. I made it on the front page a few times. I even had a fan club. My most popular story on Figment was Birdcage Girl, a serial novel that is a twist on the Rapunzel fairy tale. Birdcage Girl became one of the most popular stories on the site as well. I wrote the entire novel while I was in graduate school, enjoying posting droplets of chapters every week for eager readers. The chapters are deliciously short – I never had so much fun writing that way. I even got to talk to co-founder Jacob Lewis on the phone about it, which was a hugely special moment for me. I still hope to get this beloved story into the perfect shape one day so that it may one day sit on a bookshelf. But I believe I can do it, and that’s thanks to the wonderful readers who went on the journey with me. And stayed… even when I was mean to some characters. One of my favorite short stories I wrote was “Afternoon at Noodledom Palace,” as an entry for a time traveling contest that was judged by THE Tamara Ireland Stone! Yes, Figment was totally cool enough to have a ton of contests, some of which were judged by amazing authors. This was one of the greatest Figment moments of my life! And I’m happy to say that Tamara and I are interest author friends. It’s kind of the coolest. Okay, so before I start sniffling and reaching for a tint of strawberry ice cream, I have to end this post by talking about how much Figment.com helped me to believe in myself as a writer. For a long time, Figment was a wonderfully immersive and supportive community of readers and writers. The feedback and encouragement I received helped me to grow alongside what I was learning in graduate school, but it also allowed me to stretch my genre wings, if you will, in ways I might never had if I hadn’t joined the site. Figment gave me the courage to submit my novel manuscripts. It gave me the strength to keep going despite the rejections. Publishing isn’t easy. Whenever times got hard, I had only to look back on the Figgies that were there for me, and I was able to push through and keep going. Even now, in 2017 guys, I still believe because of Figment. So let me end here by giving you links to the very best friends I made on Figment.com who have written their own goodbye posts. You should read all of them. They’re quite wonderful. And if we knew each other in Figment and you want to reconnect, well, you know where to find me.